Royal Ascot is ideal for a special celebration in 2015. A great party atmosphere with high fashion, great horse racing and perfect for hen and stag dos, birthdays and anniversaries. We have put together exclusive party packages for groups for all days of Royal Ascot. They offer a straightforward and simple way to enjoy the full Royal Ascot experience even if you’ve never been racing before – viewing, betting and refreshments are all included and planned in advance, leaving you to concentrate on the celebrations! You can book your Royal Ascot package from Tuesday 12th October 2014 and they are available for a minimum group of 10 people in both the Grandstand and Silver Ring. A great way to start you day is to arrive by limousine, coach or minibus and enjoy drinks and a picnic before entering your admission area. 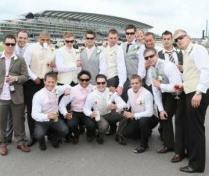 General Ascot race days are also available throughout the year.